My finished Muffaletta, a fantastic picnic treat! Here’s a picnic or backyard sandwich with a fun twist. It’s a pressed sandwich and one of the traditional methods of pressing it is with your own bottom. Take it with you to your picnic spot, sit on it during the drive, and presto — it’s ready when you arrive! My olive salad ready for overnight in the 'fridge. 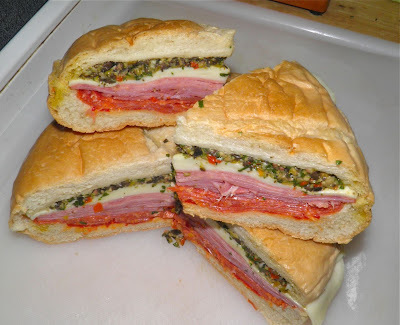 A traditional muffuletta consists of one muffuletta loaf, split horizontally. The loaf is then covered with a marinated olive salad, then layers of capicola, salami, pepperoni, emmental, ham and provolone. The size of the muffuletta is enough to feed more than one person, and many stores sell quarter or half-muffulettas. The olive salad consists primarily of olives, along with celery, cauliflower and carrot, found in a jar of Giardiniera. The ingredients are combined, seasonings such as oregano and garlic, are added, covered in olive oil and allowed to combine for at least 24 hours. Muffaletta is an actual type of Italian bread and gives the sandwich its name. The information above is more about New Orleans muffaletta. Apparently it was a creation of a restaurant there made for immigrant Sicilian workers. My recipe is slightly different, but close enough. For example I use provolone instead of emmental and my olive salad has no celery, cauliflower or carrot. Pressing the sandwich is actually a necessity. It helps meld all the flavours. It also has the practical result of making it hold together better thus being easier to slice. You can press it with a heavy weight resting in a cast iron skillet on the sandwich, or sit on it. Yes, sit on it. I find the imagery of sitting on the sandwich while driving to your picnic site far too fun to refuse to do. We’ve done both. I drove so I wasn’t sitting on the sandwich so I can’t vouch for the experience. Either way, this sandwich is a perfect picnic hit. The stuffed sandwich, ready to be put together. Peel the garlic and place in a food processor. Pulse a few times to cut up small. Add the remaining ingredients and pulse until chopped fairly small but far from a purée. Stir in the pepper and oregano. Place in a bowl, cover with plastic wrap and refrigerate overnight. Wrap well in plastic wrap before pressing. The next morning, take the loaf and horizontally slice it in two. Hollow the top and bottom pieces slightly. You are creating a small cavity for the filling to fit. 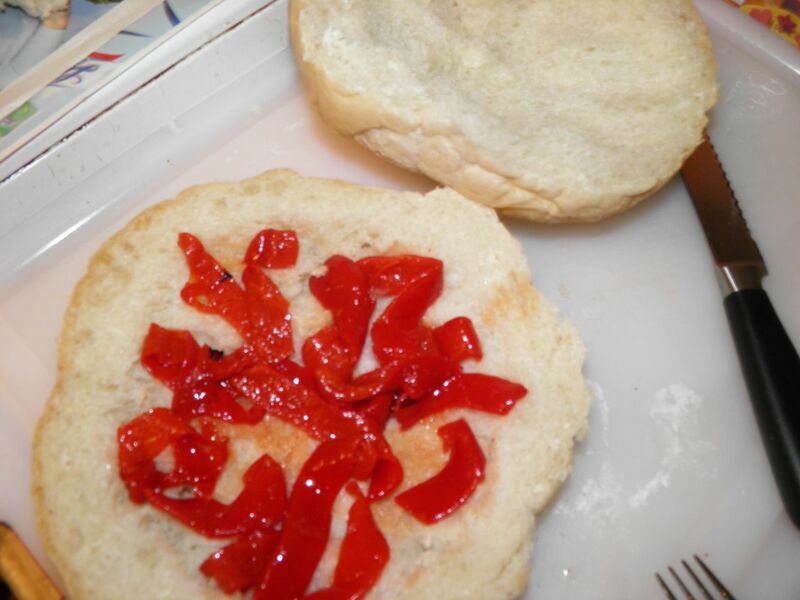 Layer the roasted red pepper slices on the bottom. Follow with the genoa salami, mortadella, and capocola. Place the cheese on top. 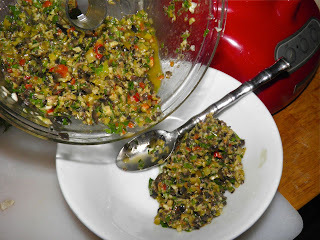 Fill the top cavity of the loaf with the olive salad. 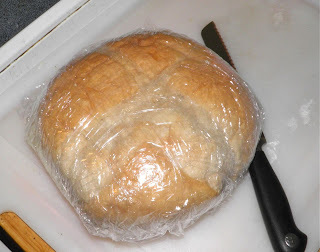 Flip the bottom part of the loaf onto the top, press down a little and then turn upright. Wrap the entire sandwich in two or three layers of plastic wrap and begin to press the sandwich. It should press for at least one hour. Pressing the sandwich is a necessity as it makes it all stay together and easier to slice. It can be done one of two ways. 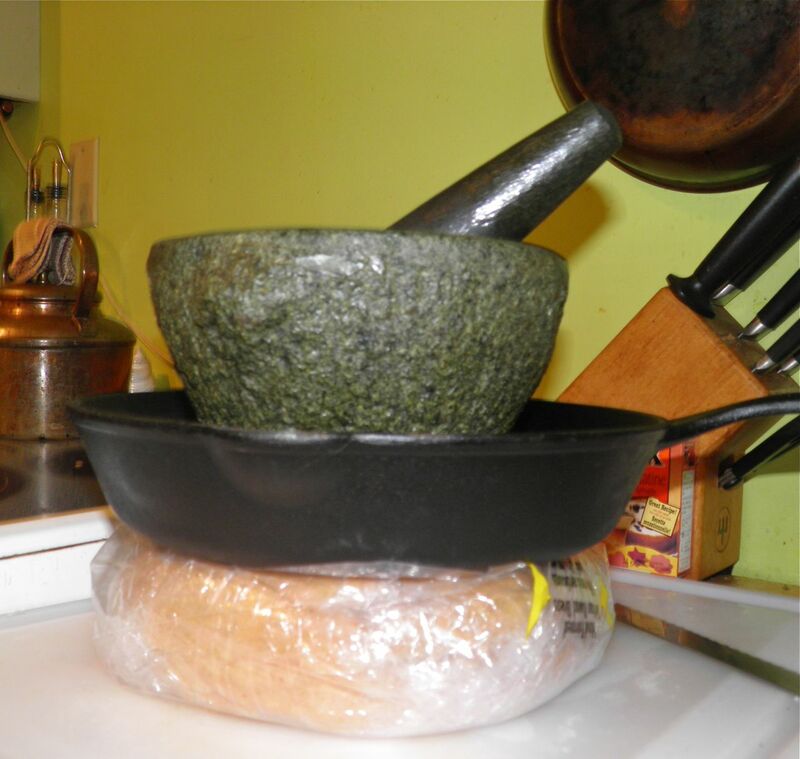 The usual way is to place a cast iron skillet on top and put a heavy weight in it. The romantic way, if you can call it that, is to sit on it in the car while you drive to your picnic spot. If your picnic spot is close you may want to combine pressing methods. 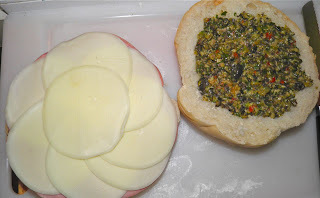 One method to press the sandwich. We will sit on it too, just for fun.